The Chippewa Men's 27872 USA-Made Black Engineer Boots have the right components for work footwear. Well-built, these 7-inch men's boots are a great choice for a variety of working environments, where the bottom line is comfortable performance. The fine Chippew ... (see full details) (see specifications) #CHP27872. The Chippewa Men's 27872 USA-Made Black Engineer Boots have the right components for work footwear. Well-built, these 7-inch men's boots are a great choice for a variety of working environments, where the bottom line is comfortable performance. 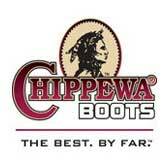 The fine Chippewa boots will help you reduce painful injuries to your feet, especially with their safety toe rating. The ASTM F2413-11 rated steel toe protection will guard against heavy work hazards that can crush your toes. They meet or exceed standards for impact and compression. This feature is highly practical for a variety of professions. Keep on going strong with coverage like this! The black leather that composes the rugged uppers on these steel toe boots is black odessa leather. This material is built strong for the wear and tear of the day. The fabric is made heavy-duty with abrasion-resistance to will keep it looking new for many days ahead. This leather is flexible and quick to break in for a comfortable fit. In addition to sturdiness and comfort, the USA-made boots are easy to maintain. Many hard working people who don't have the time to worry about their feet trust this design. Goodyear leather Welt construction and Vibram Nitrile outsoles join together to create a stabilized, strong foundation. This combination creates a wider base that's oil- and slip-resistant to keep you firmly on your feet, enhancing your performance on the job. To extend the life of this product and increase its value, this method is repairable so you can enjoy these great benefits even longer! When you slip your feet into the Chippewa Men's USA-Made 27872 Engineer Steel Toe Black Boots, you'll feel the soft cushioning afforded by the leather vamp lining. Texon footbeds are lightweight and soft to give you practical air and moisture permeability. The triple-ribbed steel shanks lend support to your arches, and they won't compromise mobility. Even the nickel non-tarnishable brass and 4 iron rubber/6 iron robus midsoles give you extra stability. For great comfort and trusted design, order these Chippewa boots today! 5 out of 15 people found this product review helpful. I don't like these very much. I think they are ugly, very poor design, and not that comfortable. I received them as a gift and I wish I could return them. I'm not sure how I'm supposed to fill up a review with 300 words when all I can come up with is I don't like them, but I'm trying. Price is terrible, color is good. Metal buckle thing is pointless. I don't know if this this was made for a man or a woman. I work in an office and am required to wear "business casual". However, I don't like "dress shoes" and frequently ride to work. I needed shoes/boots that look good and still give me protection and traction while riding. These boots are all that! Really love the Chippewa quality and the fact they are Made in the USA as well. I work in an office environment and am required to dress "business casual". However, I hate dress shoes and frequently ride to work. These boots are nice enough for work, are comfortable and work well while riding (protection, traction). These boots look really nice. I like the white stitching on the sole. The brass buckles give it that old school look. The only thing is that you have to wear them with thick socks because with thin socks, they are very uncomfortable. and they take awhile to break in. Steel toe boot are hard on yours toes, but with thick socks, they are not so bad. Chippewa Boots: Men's Steel Toe USA-Made 27872 Engineer Work Boots is being added to your cart.